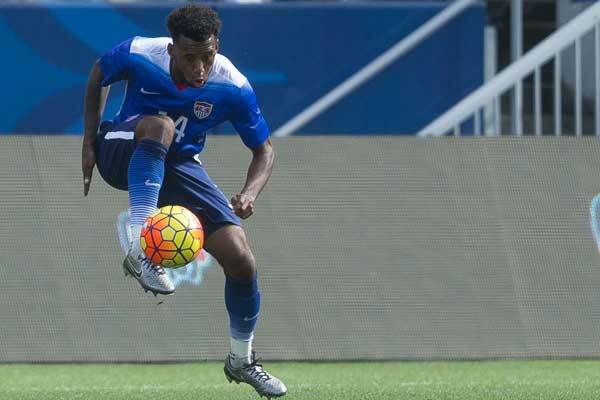 Julian Green chose the USMNT with eligibility and interest from the German National Team. Green is a product of the Bayern Munich system and the Germany youth national teams. He signed as a professional with Bayern Munich in 2013, playing in the Champions League in November. Born in Tampa, FL, Green was heavily recruited by USMNT coach Jurgen Klinsmann and eventually made the decision to switch his international registration to the USA. He played one game for the USMNT at youth level, playing 18 times at youth level for Germany. Green debuted for the senior USMNT on Apr 2, 2013 in a friendly against Mexico. On the club side, Green will spend the 2014-15 Bundesliga season with Hamburg on loan from Bayern Munich. He stayed with Bayern the following season, playing for their reserve team. Green moved from Bayern to VfB Stuttgart midway through the 2016-17 season. He went on loan to SpVgg Greuther Furth for the 2017-18 2.Bundesliga season. Obviously this was a big decision, and I spent a long time discussing it with my family. I was born in Florida and my father still lives there, so I have deep roots in the U.S. I'm very proud to be representing the United States. A big part of the decision was the experience I had in Frankfurt. All the players were super nice and welcomed me from the beginning. Clint Dempsey gave me a jersey with my name on it, and the way they supported me gave me a lot of belief. The coaches have shown a lot of trust in me, and now I hope to do everything I can to earn a spot on the World Cup roster. 2018: Subbed on against Bolivia on May 28. Started against France on Jun 9 and scored. Started against Brazil on Sep 7 and subbed on against Mexico on Sep 11. Started against Colombia on Oct 11. Subbed on against Peru on Oct 16 and started against England on Nov 15. 2016: Started against Puerto Rico on May 22. Started against Cuba on Oct 7 and scored. Started against New Zealand on Oct 11 and scored. 2014: Completed a change of association with FIFA in time to join the USMNT in camp for the Mexico friendly in April. Made his debut for the USMNT on Apr 2, subbing on in the second-half against Mexico. Named to the final USMNT World Cup roster. Subbed on in the second-half against Turkey on June 1st. Subbed on in extra time against Belgium in the World Cup Round of 16 and scored. Started against the Czech Republic on Sep 3. Subbed on in the second-half against Colombia on Nov 14. 2017-18: Joined SpVgg Greuther Furth on loan, finishing 15th in the 2.Bundesliga. 2016-17: Joined Stuttgart during the January transfer window, winning promotion to the Bundesliga. 2015-16: Played in the reserve team for Bundesliga and DFB Pokal winners Bayern Munich. 2014-15: Loaned to Hamburg from Bayern Munich, finishing in 16th-place. 2013-14: Signed as a professional with Bayern Munich, appearing for their reserve side. Made his Bayern debut in the Champions League on Nov 27, 2013.